Nicotine addicts who find themselves mindlessly smoking through the streets of Stockholm are being reminded that the habit isn’t healthy – but not by a doctor. Instead, a billboard equipped with smoke detectors is ‘coughing’ as they pass by. 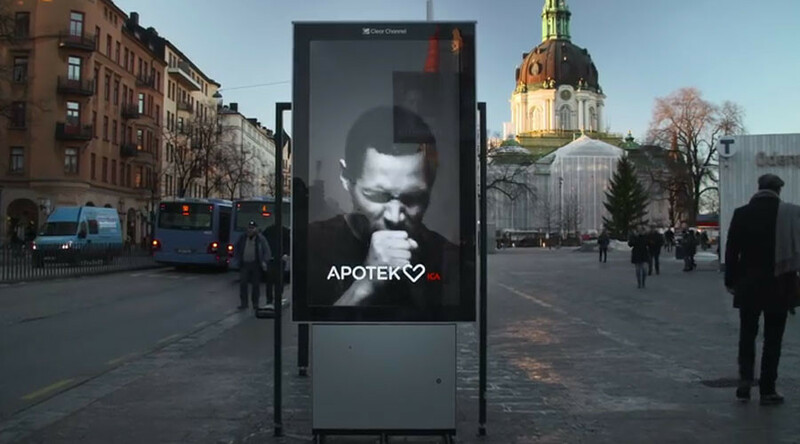 The electronic sign featuring a black-and-white picture of a man seems usual enough upon first glance and for non-smokers it will continue to appear ordinary. However, smokers will see a different side of the billboard when they walk by, as the man on the sign begins coughing in reaction to their secondhand smoke. A video that the pharmacy posted online shows the mixed reactions of passersby, ranging from confusion to amusement. One man looks at the sign while continuing to puff on his cigarette, while a woman starts laughing after realizing she was the one who triggered the coughing. The billboard ends with an advertisement for nicotine gum products from various manufacturers. Although the billboard has apparently been placed in an area “where people smoke a lot,” Sweden actually has the lowest smoking rate of all European Member states, just 13 percent, according to a 2012 report by the European Council.